Verdun ( medieval German: , official name before 1970 Verdun-sur-Meuse) is a small city in the Meuse department in Lorraine in north-eastern France. It is a sub-prefecture (arrondissement) of the department. Verdun is the biggest city in Meuse, although the capital of the department is the slightly smaller city of Bar-le-Duc. Verdun (Latin: , meaning "strong fort") was founded by the Gauls (as its Celtic name shows; "Dunum" is the Latinized version of a Celtic word meaning oppidum). It has been the seat of the bishop of Verdun since the 4th century AD, with interruptions. 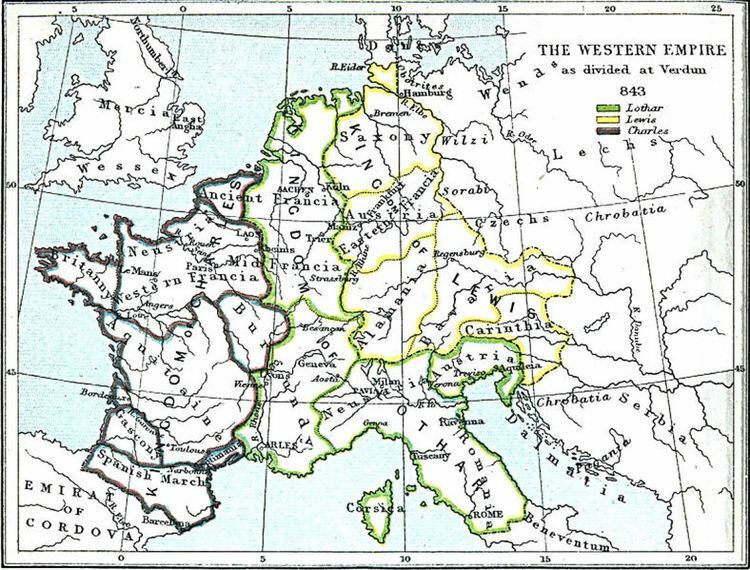 In the Treaty of Verdun in AD 843, the empire of Charlemagne was divided into three parts. The city has been famous for Dragees or sugared almonds from 1200 onwards; they were distributed at the baptism of French princes. Verdun was part of the middle kingdom of Lotharingia, and in 1374 it became an Imperial Free City of the Holy Roman Empire. The Bishopric of Verdun formed together with Tull (Toul) and Metz the Three Bishoprics, which were annexed by France in 1552 (recognized in 1648 by the Peace of Westphalia). From 1624 to 1636, a large bastioned citadel was constructed on the site of the Abbey of Saint Vanne. In 1670, Vauban visited Verdun and drew up an ambitious scheme to fortify the whole city. Although much of his plan was built in the following decades, some of the elements were not completed until after the Napoleonic Wars. Despite the extensive fortifications, Verdun was captured by the Prussians in 1792, but abandoned by them after the Battle of Valmy. During the Napoleonic War, the citadel was used to hold British prisoners-of-war. In the Franco-Prussian War, Verdun was the last French fortress to surrender in 1870. Shortly afterwards, a new system of fortification was begun. This consisted of a mutually supporting ring of 22 polygonal forts up to 8 kilometres (5.0 mi) from the city, and an inner ring of 6 forts.